It's not quite his own brand, but Kobe will take the continuation of his shoe line. It’s not often that an NBA player receives a signature shoe line from one of the major kicks manufacturers. And it’s even rarer for said line to continue into perpetuity after the player retires. On that front, it’s basically Michael Jordan and nobody else. Where do you see the Kobe line going after you retire? We’ll remain extremely consistent with what we’ve been doing, which is creating innovative products that help athletes be the best versions of themselves. That’s not going to change. I don’t focus on how fashion changes. I only focus on creating innovative product. Hopefully the consumer knows by now that if you’re buying a Kobe product, you’re buying something that’s been thought through. We pay attention to detail all the way through. You’re buying something that’s going to help you perform better. That’s not going to stop. So you’re saying there’s going to be a Nike Kobe 12, 13 and so forth? Absolutely. We’ll continue to evolve. We’re going to continue to push and the line will keep growing. Nike originally signed the future Lakers Hall of Famer to a $10 million-per-year contract in June 2003, prying him away from Adidas, which had signed Bryant to his first sneaker deal out of high school. This isn’t exactly news, per se, since we kind of figured Nike would keep printing money with Bryant’s shoes; Nike sold $105 million worth of Kobe Bryant apparel in 2014, the most recent year for which there is readily available data. 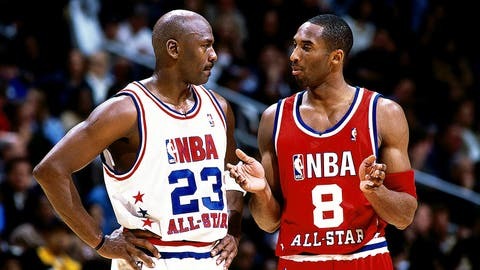 It is, however, another way in which Bryant and Jordan will forever be linked in basketball history. While Jordan gets set to release the 30th iteration of his signature line, we’re just happy to know that we need to make room in the closet for Kobe 12s, 13s, and so on and so forth. Unfortunately for Bryant, as with rings, he’ll fall short of the lofty standards set by His Airness in the sneaker game. After all, it’s pretty cool that Kobe will keep working on his signature shoes after his playing career is over. But Jordan has his own standalone brand within the larger Nike company. And that’s the coolest status of them all.